For over a quarter century, I have been known in the classical music world as a concert guitarist, following the tradition of the great Spanish guitarist Andrés Segovia. However, there was a time in my life when I stopped concertizing and recording, and even gave up practicing the instrument. Apart from a small amount of teaching at Montana State University, I quit the guitar completely. This is the story of why I decided to perform once again. I grew up in Los Angeles and started playing the guitar at the age of 11, inspired by my cousin, Jack Marshall, who was staff guitarist at MGM Studios. I loved the way he played the guitar, and I asked him about studying the instrument. He recommended that I learn classical technique first to establish solid technical skills. He also suggested I purchase the recordings of Andrés Segovia, the greatest guitarist in the world. I was so impressed with Segovia’s playing that I started classical, loved it, and stayed with it. Even before I began playing the guitar, I had a great love of the outdoors, in particular, fly-fishing for trout. My dad taught me the art of dry fly-fishing when I was six years old. The most enjoyable times of my life were spent on a trout stream in the High Sierras of Northern California. My goal in life was to some day own my own ranch with my own private trout stream. As I grew up, I became convinced that my aim should be to make a lot of money, retire early and enjoy the good life. Since my father had retired at 47, I decided that 30 would be a good retirement age for me. And as I became more proficient with the guitar, I wondered if my musical ability might somehow help me achieve that goal. I grew up in a home that taught me the value of hard work and discipline. With my father’s encouragement, I would get up at 5:00 a.m. and practice for an hour and a half before school and again in the afternoon. You can imagine what a conflict that created for a young man with a keen interest in sports. However, with the support of my parents, the hard work began to pay off. Four years later, at age 15, I was invited to attend Andrés Segovia’s first United States master class held at the University of California at Berkeley. It was a great honor to play for the man who had inspired me for so many years. 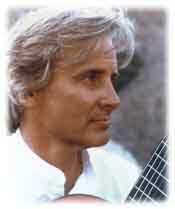 He told me I had the potential for a wonderful career with the classical guitar and encouraged me to work “very hard.” It was my good fortune to continue private study with Segovia and later, when I attended the University of Southern California, to study musical interpretation with the world renowned cellist Gregor Piatigorsky. At age 19, I signed with Capitol Records for a series of six albums, and was asked to start a guitar department at the University of Southern California. The following year I signed with Columbia Artists Management for a rigorous concert schedule touring the United States, Canada, Europe, and Asia, eventually performing over 90 concerts a year! Needless to say, as I added a grueling concert schedule to my teaching and recording obligations, my life became ever more stressful. Frankly, I was miserable on tour. I hated the hotel rooms, the airplanes, the monotony of one concert after the next. But, I thought, There will come a day when I will be happy. I’ll have my own ranch with my own trout stream and I can retire. I can do what I want to do, go where I want to go, and be content. And that was the goal I pursued. At 30, I achieved my goal. I stopped playing the guitar, I found a ranch with a beautiful trout stream in Montana, and I moved there from Southern California. I called Capitol Records, USC, and Columbia Artists Management to thank them, and to let them know that I wouldn’t be playing the guitar anymore. I had achieved my life’s dream. For the next four years I was doing everything I wanted to do. I was fishing to my heart’s content, learning every trout stream in the area, and going back to Southern California in the winter to escape the snow and cold weather. I was living the good life—or so I thought. There’s an old proverb: “Be careful what you wish for, you might get it.” Well, that was the case with me. Soon after retirement, I became bored with my life and began to feel empty inside. It was like Solomon said in the Bible, “Vanity of vanities! All is vanity” (Ecclesiastes 1:1). My “ideal” life was turning out to be not so ideal after all. I needed something more, something to provide the fulfillment my success wasn’t giving me. My new commitment to Christ gave me a great desire to read the Bible and learn more about the Word of God. One day I read a passage from 1 Corinthians which said, “Whatsoever ye do, do all to the glory of God” (1 Corinthians 10:31). Well, there were only two things I knew how to do: one was fly-fishing for trout, and the other was playing the guitar. The latter seemed the better option to pursue. The great composer J.S. Bach said, “The aim and final reason of all music is none else but the glory of God.” Bach signed many of his compositions with the initials S.D.G., which stands for Soli Deo Gloria (to God alone the glory). I thought, If Bach could use his great ability for that purpose, that would be the least I could do with whatever ability or talent the Lord had given me. It became evident that the Lord wanted me to return to playing the guitar again, but this time with a different purpose—to honor and glorify my Lord and Savior Jesus Christ. Shortly after making my decision to return to playing, I sold my ranch in Montana and returned to California. Initially, I had a rude awakening when I contacted my former manager in New York. He told me flatly that I had thrown away a very valuable career and that it would be extremely difficult, if not impossible, to return to the concert stage after a four year absence. I knew that all things are according to God’s will and that it would be only by His grace that I would be able to return to a professional music career. The Lord has been gracious! Since my return to the music world I have played with every major orchestra in the nation, traveled the world on countless concert tours and have even played for the President of the United States at the White House! Andrés Segovia was my musical inspiration growing up, and I still desire to follow with excellence the musical tradition he left us. However, my true goal in life now is to be a good and faithful servant of the Lord Jesus Christ. My career is only a means to an end, and that end is to glorify the Lord with my life and with the music that I play. Pursuing that goal gives me great joy and contentment; the fulfillment which eluded me so many years ago has at last been found and the emptiness I once felt has gone forever. I went on to say that God is also a loving God. That famous Bible verse, John 3:16, says, “For God so loved the world, that he gave his only begotten Son, that whosoever believeth in him should not perish, but have everlasting life.” God judges those who sin, but in love He gave His Son to die on a cross to bear our sin and judgment. Someone was embezzling from the king’s treasury, so the king issued an edict throughout all the land, saying, “Whoever is guilty, come forward and receive a just punishment of 10 public lashings.” But no one came forward. The second week someone was continuing to steal from the king’s treasury, so the king set the punishment at 20 public lashings. But still no one came forward. The third and fourth weeks went by and the thievery continued. On the fifth week the king set the punishment at 50 public lashings. Finally, the guilty person was discovered. The one embezzling from the king’s treasury turned out to be the king’s own mother! The whole kingdom turned out to see what the king was going to do because they knew he was in a real dilemma: On the one hand he loved his mother, yet he knew that 50 lashes would very likely kill her. On the other hand he had a reputation for being a just king who would certainly punish the crime. On the day for sentencing to be carried out, his mother was tied to a stake and a big man was ready to flog her with a whip. Then the king gave his order: “Render the punishment!” Just as he spoke, he took off his own robe, baring his own back, and putting his arms around his mother, he then took the lashes that she deserved, thereby satisfying the demand for justice. The Bible says: But he was wounded for our transgressions, he was bruised for our iniquities: the chastisement of our peace was upon him; and with his stripes we are healed. All we like sheep have gone astray; we have turned every one to his own way; and the Lord hath laid on him the iniquity of us all (Isaiah 53:5-6). Who his own self bare the sins in his own body on the tree, that we, being dead to sins, should live unto righteousness: by whose stripes ye were healed (1 Peter 2:24). As I told little Christi, that’s exactly what Jesus Christ did for us. Jesus Christ, by His death and physical resurrection, paid for our sins and purchased a place in heaven for us, which He offers as a gift that may be received by faith. I told her, “You have a choice in this life: You can stand before God when you die and say, ‘I’ve been a good girl,’ but you will fall short. You could say, ‘The good I’ve done outweighs the bad,’ but you will still fall short. You can even invent your own standard for heaven and achieve that, but God’s standard is perfect righteousness! Or, you can humble yourself and receive the gift that God has described in the Bible: ‘Neither is there salvation in any other: for there is none other name under heaven given among men, whereby we must be saved’ (Acts 4:12). Jesus said, ‘I am the way, the truth, and the life: no man cometh unto the Father, but by me’ (John 14:6). Lord Jesus, I know that I’m a sinner. I’ve been trusting in my own good deeds to save me, but now I’m putting my trust in You. I accept You as my personal Savior. I believe You died for me. I receive You as Lord and Master over my life. Help me to turn from my sins and follow You. In Jesus’ name I pray. Amen. I hope that you will make this prayer your own so that you can join with me in living life for God’s glory. If you have any questions, I hope you will contact a Bible teaching church in your area or write to me by clicking the link below.